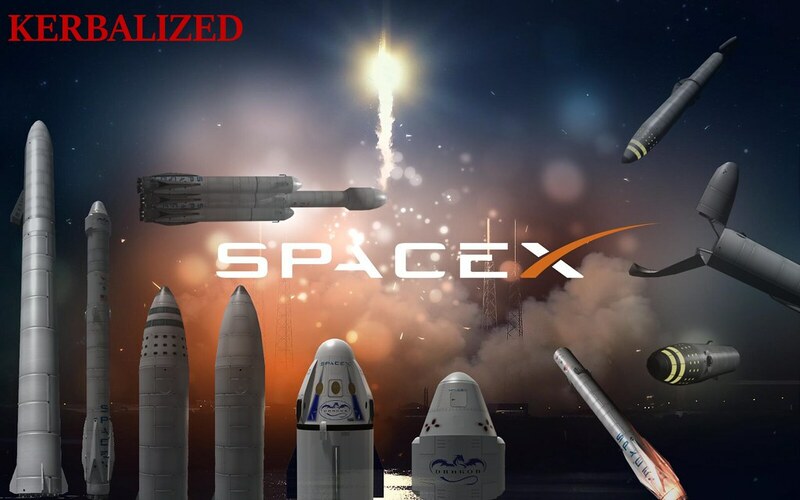 Want to build the SpaceX BFR crew/cargo, Falcon 9, falcon heavy, etc.... This mod is for you! This mod is designed to help you save on part count big time. Be it docking ports to cargo bay's- every part is integrated with something (or multiple somethings) to help you lower your parts count. 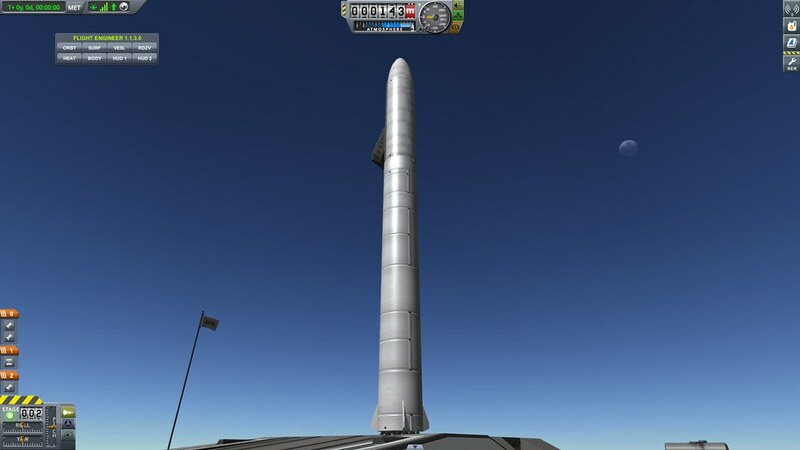 HOW TO RE-ENTER WITH THE "BFR" -Kill 98% of velocity on a 55 ton vehicle with aerodynamics only-. (I took a steep angle of attack, and experienced very high G's, with good piloting skills and a lower angle of attack you can limit the amount to under 5g's. 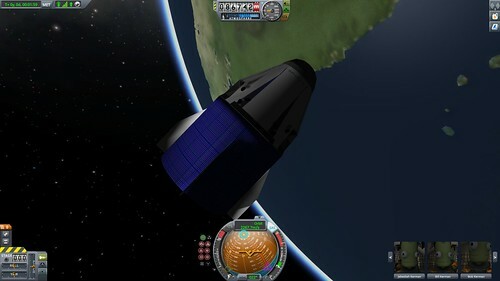 This happens during the flip maneuver(You will see). Pods- Dragon, Dragon V2, ITS Titan, Space Bug, BFR crew & cargo variation. 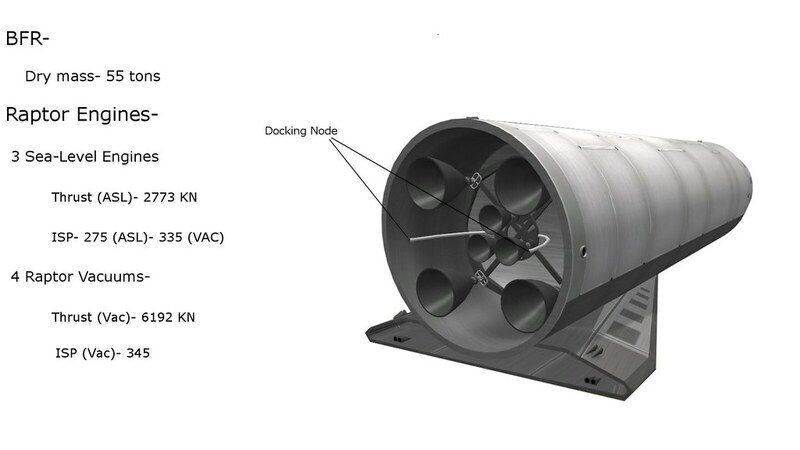 Engines- *31 raptor cluster, *3 raptor cluster, *4 raptor vacuum cluster, *9 merlin engine cluster, merlin vacuum, merlin atmospheric. 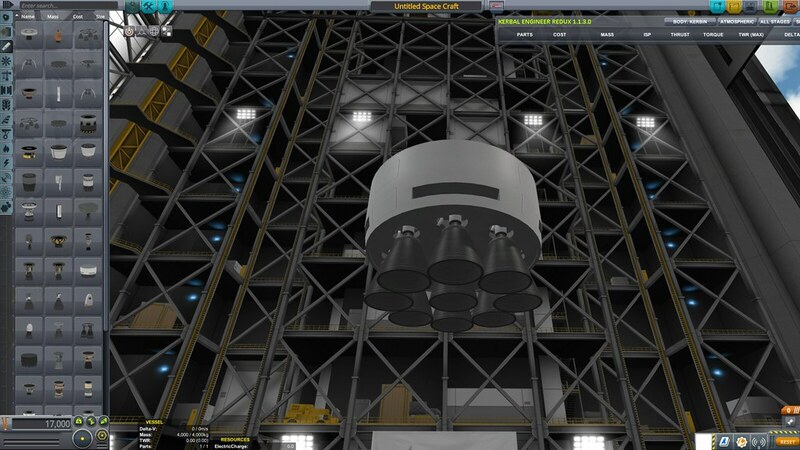 Misc: Dragon 1 trunk, Dragon V2 trunk, Dragon nose cone, Dragon panel Covers, Heat shield, Falcon Legs, Aero Fins. Requires "near future solar" for the solar panels on the trunk to work. 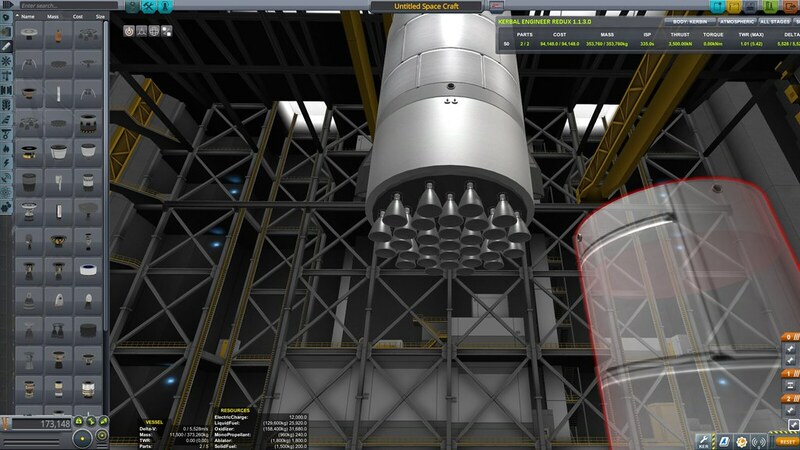 RPM and Asset Props are required for any functionality in the V2's IVA. 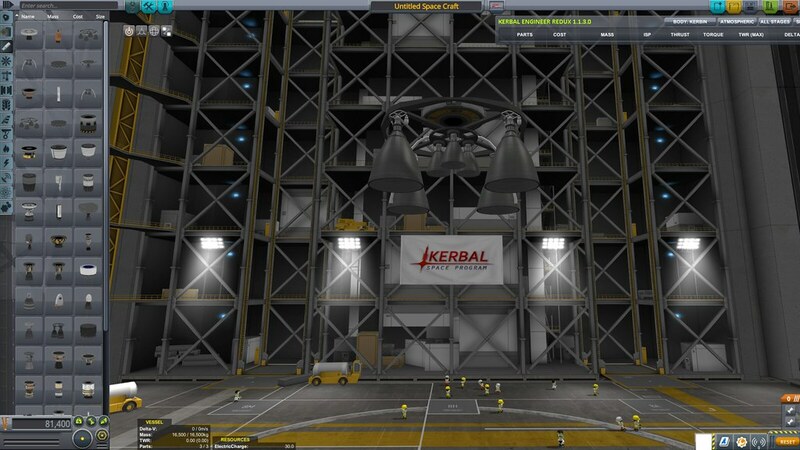 Recommendations: Kerbal joint re-enforcement will make ur life much easier playing with the BFR. Thanks to @Mecripp for converting all the textures to .dds and for his help in various other areas. Thanks to all my followers for helping me keep the ambition to continue the development of this mod! I likely would have stopped with the V2 if it wasn't for you guys. 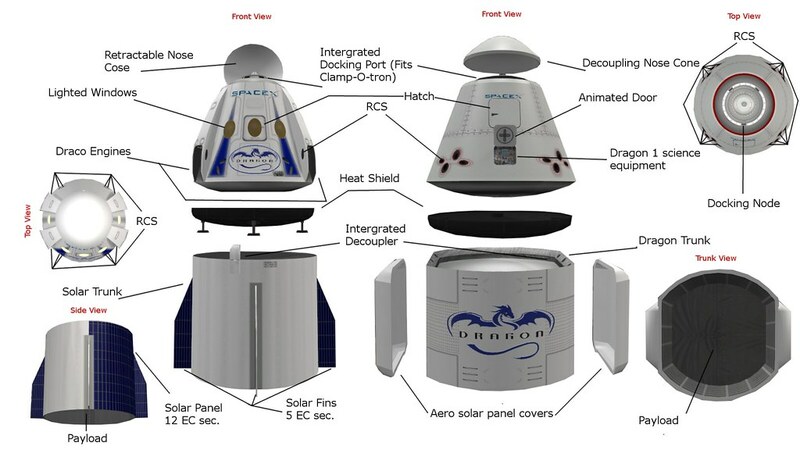 My First plan will be to touch up anything that needs it on the dragon v2 pod make an IVA and trunk for it. After that I'm stuck in between two directions of which to go. 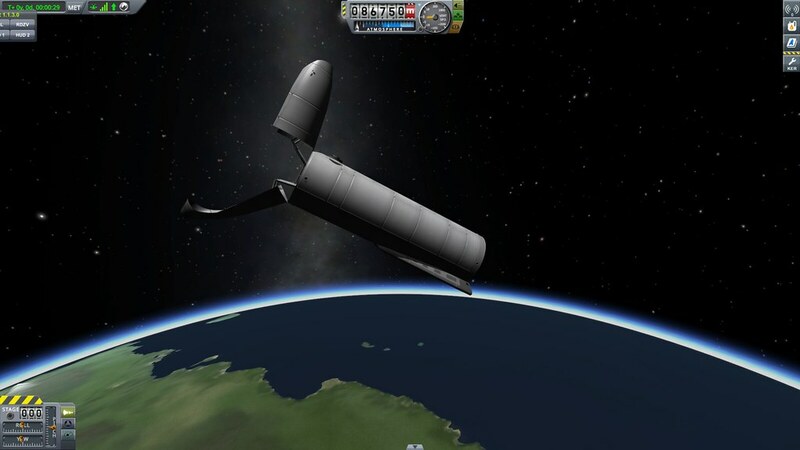 I'm considering nothing but a command pod mod or a colonization type space x inspired mod. What do you guys think? I ran into a peculiar bug. 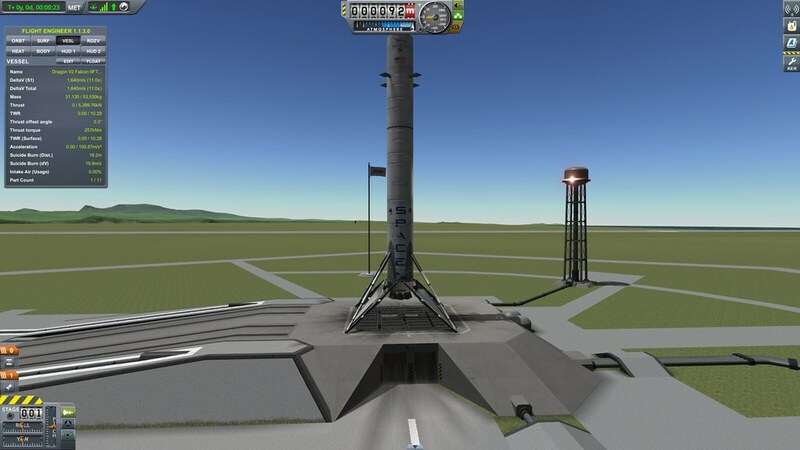 In addition to your mod, I have also installed the KerbalX Dragon and Falcon mod. I can open your Dragon in the HAB, no problem. 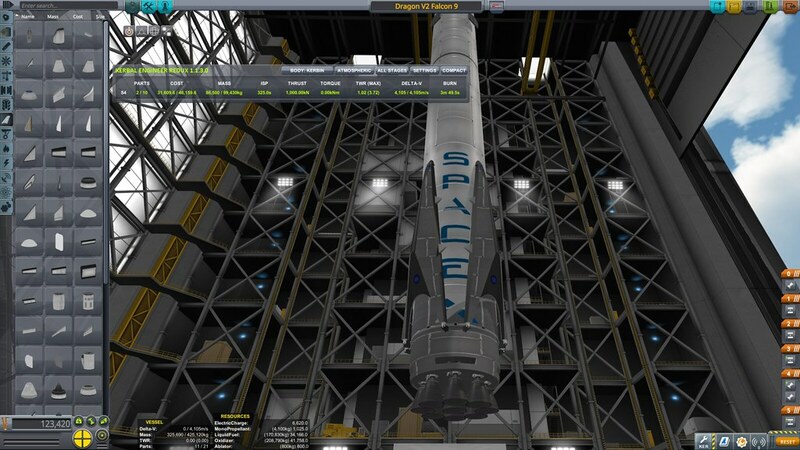 However when I click to send it to the launch pad, I get the KerbalX version. I suspect there is some kind of naming conflict. @thomash Yes, the mods have the same name for the Dragon pod. Thanks for the heads up. will fix immediately. Probably a silly question, but... Does it will work in 1.2.2? It is not localized, so yes, it should work in 1.2. @harrisjosh2711 Can I make you a trunk texture like shown here? Also, may I suggest stock-alike naming, like for example, TR-500 and DPD-1A "Sparrow"? @Bottle Rocketeer 500 absolutely! 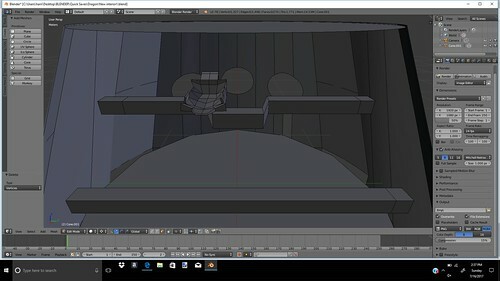 I just watched that animation yesterday, checking out the interior on the V2, and wanted to re-texture the trunk as such. And yes I will start trying to use more stock-alike names. If you really want to help me make a new texture for the trunk I would be glad to send you the blender file or whatever you need. I have been contemplating downsizing the dragon v2 to 2.5 from 3.75. 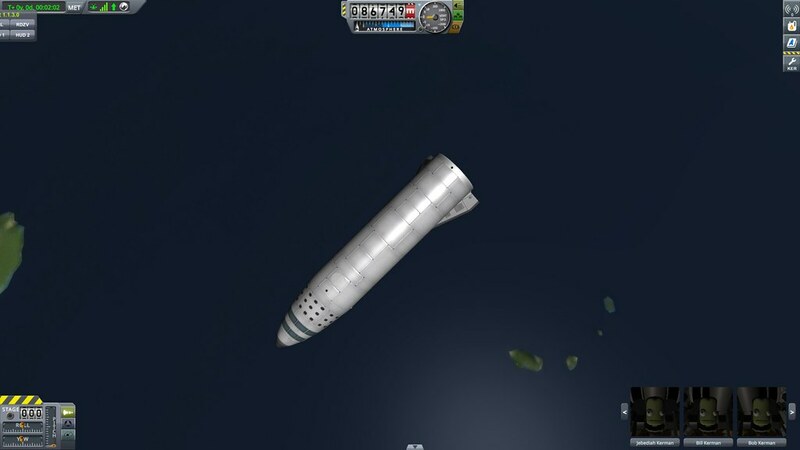 I originally wanted to make it a larger capsule but testing without mods has made me realize stock ksp is especially sparse in parts that will support a 3.75 command pod. 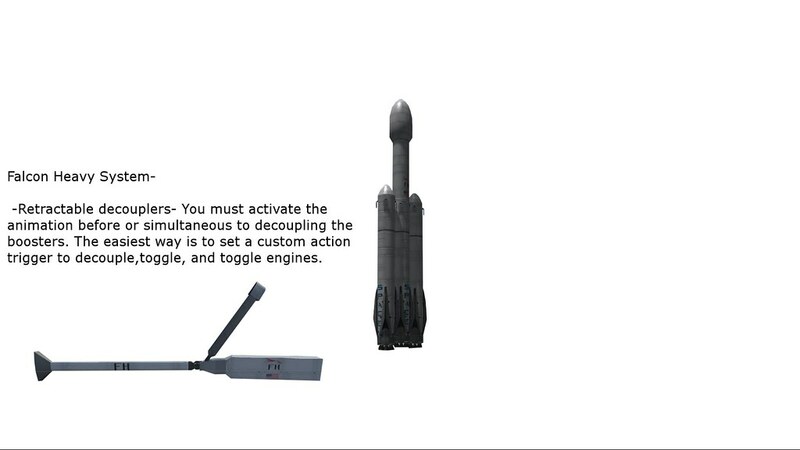 I made this to fit the size of the SpaceX launchers pack already on the forums, as I have no intention on adding any more fuel tanks(we have enough as it is). With that said what do you guys think, 2.5 or 3.75? 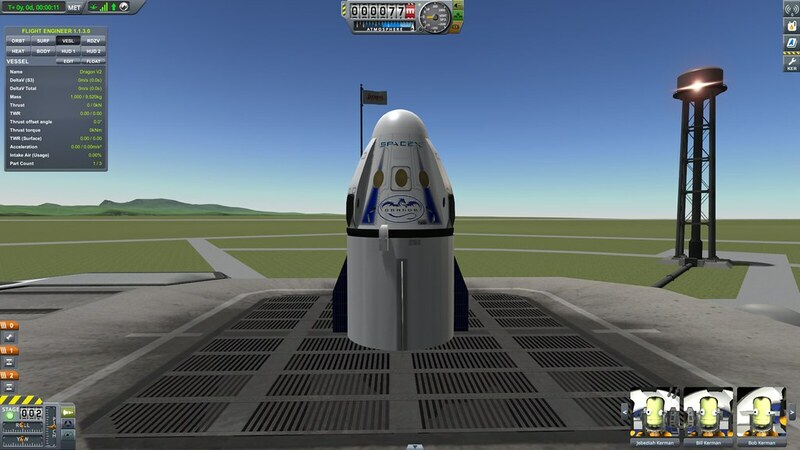 THe real Dragon2 is 3.7m in diameter, so I'd stick with the way it is currently. Awesome job btw! I don't need the .blend file for it, only the texture to recolor. Also, how did you make it not appear sideways or have an overly cluttered UV map? @harrisjosh2711 I can do the rescaling for you. @Bottle Rocketeer 500 I have already figured out the rescale value, it would be .65 for a 2.5. As for the texture, "how did you make it not appear sideways". If u are using blender, after you have unwrapped the mesh you select the mesh in the UV map and rotate it with R. To avoid over cluttering- unwrap the object in a logical manner (not all at once), I try to cube unwrap objects that are the same shape and color together, which essentially stacks them on top of one another when mapped. Also, if all else fails and you don't have enough room- make another map. I have found, especially with the dragon interior, UV unwrapping can be an artwork in-itself. @harrisjosh2711 Which part of the texture is which? Added a pull request for rename and rescale.